Mila is healing quickly and we are planning to get back on our bikes to tackle the Rhine at the end of the month. We have train tickets to Bregenz, Austria which is just past Chur – where Mila broke her arm. 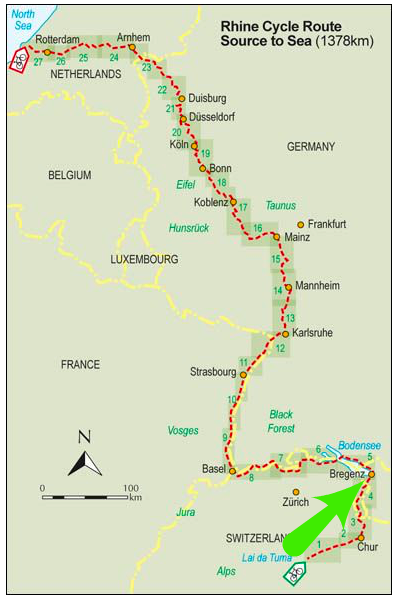 We will then make another attempt at cycling to the mouth of the Rhine at the North Sea. The catch is that we will have to do it much more quickly than we originally planned. The original idea was to make it a slow and leisurely ride with not too many kilometers (miles) per day, and the time to stop and enjoy the interesting places that we might find along the way. Regrettably the EU will only allow us to stay 90 days out of any 180 days. This means that we have to be out of the EU (actually the Schengen Countries) by the 28th of September. That gives us about one month to git ‘er done. To help address the issues of way-too-much-stuff and overloaded bikes, we’ve bought a trailer. Dutch trains don’t allow trailers, but this one is designed with that in mind. The wheels and the tow bar pop off and the trailer instantly becomes a big duffel bag. With some luck we can get it onto the trains. As with everything there are tradeoffs, but hopefully the benefits of getting a bunch of junk off our bikes and onto the trailer will outweigh the costs. The pros and cons of trailers are endlessly debated and there are stalwarts in both camps. I won’t rehash them here, but if you are interested, here is one guy’s detailed analysis and a quick Google search will reveal about a million more. Most importantly, having the trailer will allow us to shift a bunch of our load off of Mila’s bike for less stress on her arm and improved bike handling and safety. It will also shift much of the load on my bike from the frame to the trailer, which will also greatly improve the handling of my bike. I just hope the rear triangle of the frame is strong enough to handle the loaded trailer! That risk comes along with my stubbornness/madness of wanting to do the trip with the simplest “regular” bikes and not a bunch of specialized touring gear. That would be too easy, LOL! Jette’s Birthday earrings are very very pretty! Also the Trailer looks super fun to ride in! Hope they will let you bring it on the train! It is super fun to ride in, and I think they will. Thanks for educating me on the Schengen Countries! I eagerly await your posts so thanks for the movies and notes. “The girls” say hi too!